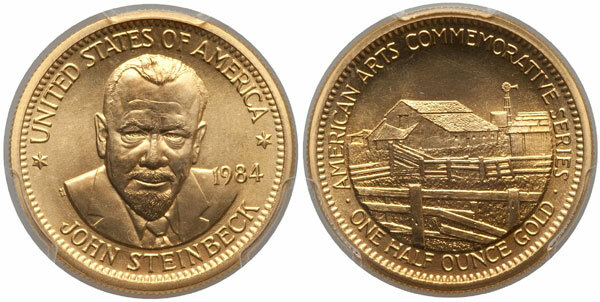 For the fifth and final year of the American Arts Commemorative Series, a one-half ounce gold medallion was issued to honor author John Steinbeck. He was the author of such well known works as Of Mice and Men, The Grapes of Wrath, and East of Eden, each of which have been widely read and adapted to film. He was the winner of the 1962 Nobel Prize in Literature. The obverse design of the medallion features a front facing portrait of the author dressed in a suit and carrying an intense gaze. The inscriptions read “United States of America”, “John Steinbeck”, and “1984”. The reverse carries the image of a farm scene reminiscent of the setting of many of Steinbeck’s works. The inscriptions read “American Arts Commemorative Series” and “One Half Ounce Gold”. The method of distributing the American Arts Medallions was changed for the final year of the series, which would have an impact on the mintage and sales levels. Previously, the firm J. Aron & Company was the exclusive distributor of the medals, subject to certain minimum purchase guarantees. This year, the firm was let out of their contract and the medallions were sold by the United States Mint through a telephone ordering system. The new medals were offered to customers who had purchased medals in previous years. Later, complete five piece sets of either the one ounce or one-half ounce medallions would be offered. The John Steinbeck American Arts Gold Medallion had a total mintage of 35,000 pieces, together with the Helen Hayes Medal marking the low for the series. Total sales for the Steinbeck Medal reached 32,572, representing the low for the series. Due to the change in distribution method, melting had a far more limited impact on the survival rate of this issue compared to the previous years. Nonetheless, the two 1984 medals are seen as the second scarcest issues of the series after the 1983 Alexander Calder medal.